Arlene Schragger of ads Public Relations & Marketing provides practical, profitable public relations and marketing communications solutions for your small business or start-up. If you are overwhelmed at the thought of planning a marketing campaign, confused about where and how to advertise your business or service or want to know how everyone else gets into the paper, we can help you! Have you done a mailing with little or no results? Have you placed an ad once or twice and no one responded? 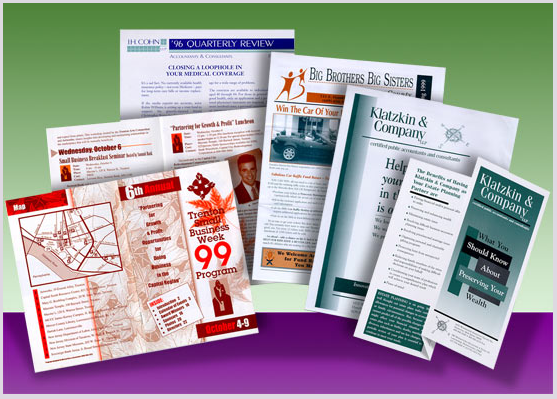 Do your existing brochures and business cards (i.e., promotional materials) tell your story in an easy to read, essential style? Have you ever written a press release celebrating your successes or setting you up as an expert in your field? Are you looking for ways to cross sell to existing clients and attract new buyers? Do you need to work on getting more business but don’t have the time? You need Arlene Schragger and ads Public Relations & Marketing to work for you as your company’s Marketing Communications Department! Save time and money, reduce your stress level and be free to concentrate on the parts of your business that you do best. We take over the marketing/promotions aspects of your business, working closely with you and speaking in your own voice. “I just received my copy of the brochure—it is beyond my expectations, just beautiful. Thank you so much for the professional job—“awesome” is all I can say.